I wrote last week about querencia, that physical or psychological place of refuge where each of us finds our strength, safety and sanctuary. It’s where we can be our most authentic self. I noted that in the days ahead it was going to be important for each of us to know where our own querencia is and to have it as our refuge and place of refueling. Over these past few days, I’ve also seen that querencia comes in another important form: friends. Even when it feels like we’re alone, or when dismay threatens to choke all hope, friends appear to make us realize we’re not alone—we’ll get through this together. Friends are found in the usual ways: the people we’ve known for years whom we can call, or get together with for lunch or coffee, or chat with at the mailbox. We share our pain and bewilderment, we explore ideas, and we find solace in laughter. There are also what I call “21st century friendships.” No less real, these are people across great distances, people we may never even have seen in-person and couldn’t pick out of a line-up, but they are friends just the same. We’ve met them through online classes, social media, and blogs. In recent days, friends of both types have been gold. They called, emailed, or texted at just the right moment—a thoughtful image, a righteous quote, or a joke to put it all in perspective. They were querencia. I found lavish querencia yesterday walking with my sister-in-law and an amazing 130,000 people across the streets and hills of Seattle. The march—triple the number that had been anticipated—was peaceful, joyous, and immensely energizing. Ordinarily, I feel overwhelmed and grumpy in huge crowds—this was just the opposite. There was always plenty of room for everyone, and on the faces of my fellow marchers smiles, laughter and hope abounded. Friends who were not able to march had sent messages of solidarity and were with us in spirit, providing strength and resolve. The message we sent was one of great hope and greater determination. Anyone who fails to see and hear it is delusional. This blogging community has also certainly been a place of querencia for me in recent weeks and days. So many people in this community have shared their grief, their wisdom, their sources of inspiration, and their humor (always needed and always appreciated!). Thank you to so many friends who offered—and continue to offer—strength and support. Thank you for being querencia. 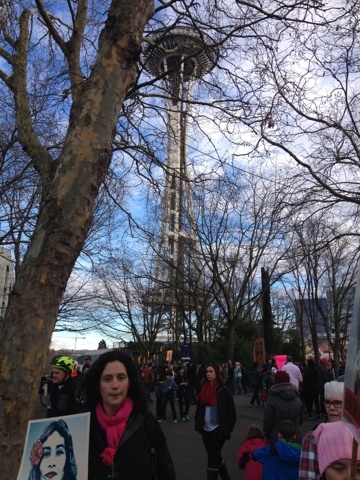 This entry was posted in Courage, Gratitude, Kindness and tagged Courage, Friendship, Grace, Kindness, Querencia, Women's March by Donna Cameron. Bookmark the permalink. Thank you Donna for your excellent thoughts and inspiration to all of your friends and readers. Thanks so much, Gretchen. I’ll look forward to telling you more about our amazing day in Seattle! 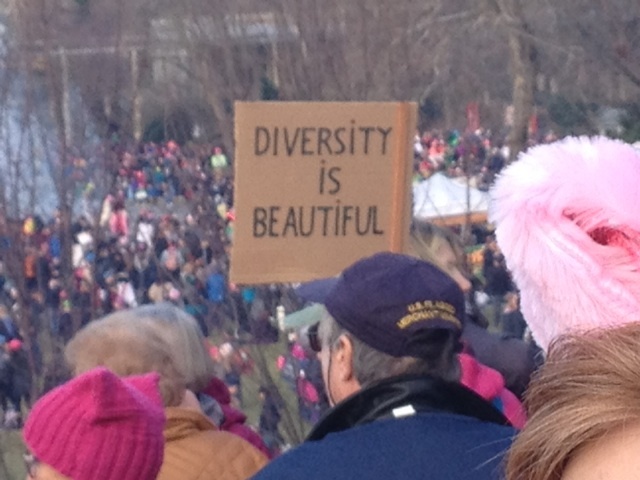 It’s amazing how many people from around the world have commented on the positive nature of their individual marches. We were all disheartened with the election outcome, but found strength and hope by marching together through the streets of our cities. 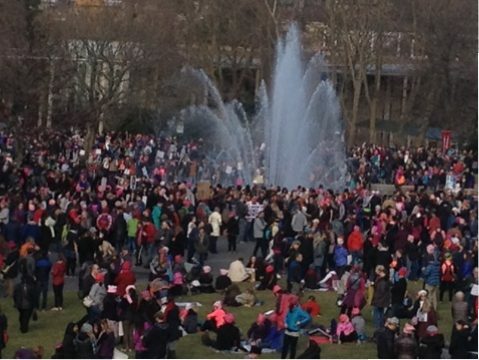 Seattle’s march looked so much like ours in San Diego… and the ones across the country and the globe. We found our Querencia in each other. It truly is amazing, Janis. I hope this means that we have claimed our power and our strength and will not relinquish it for anything. This sense of connection must be maintained and nurtured–even if there are dark days ahead. Thanks so much for commenting. Yes, indeed. Make America kind again! Is that you in the photo, Donna? Kind thoughts from us here in Australia. Good to be connected. 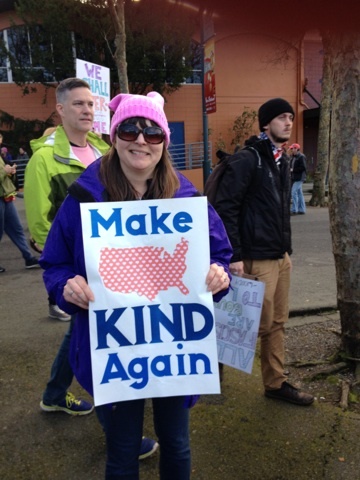 No, it’s not me holding the “Make America Kind Again” sign, but when I saw the sign I asked permission to take her picture and she assented readily. She told me she is an elementary school teacher and spends a lot of time talking about kindness with her students. So, there may be hope for the world, after all. Thank you, Carol, and your fellow Australians for your kind thoughts. It’s feeling like we have a worldwide movement to restore civility and honesty…. Love does trump hate. Great hope and greater determination — amen to that! 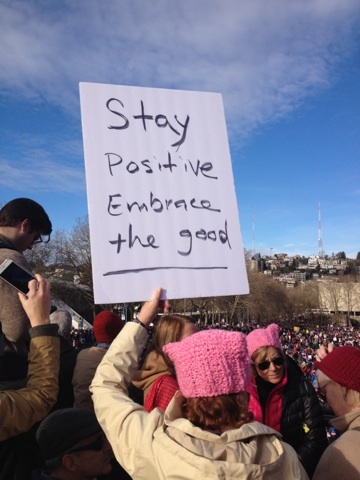 All over the world, the Women’s Marches were unifying, uplifting and galvanizing. We were a buoyant crowd of 1,000 in our little town. Thanks for sharing your experience and pics, Donna. Next: unfailing and ongoing action, YES! Yes, for sure! Unfailing and ongoing action, Kris! How cool that Port Townsend had 1,000 people, not to mention the ones that bused to Seattle. Thank you for your inspiration in a time when we need all the encouragement and uplifting that is available for it is hard to stay positive these days. I think any advocate of freedom and equality must stand up and voice their opposition to what is happening in the world today. Thank you for your kind words and your affirmation that those of us who treasure freedom and equality must stand up and voice our opposition. You are so right! Thanks so much for visiting and taking the time to comment. We are kindred spirits, writing about loneliness and friendship and kindness. And of course -standing up for each other and doing the right thing. Back in the 60’s I used to sing a song “We Shall Overcome”. I had no idea that 55 years later I’d really get the full meaning thrown at me full force by an orange-faced buffoon. It has been gratifying to find so many kindred spirits and like-minded friends–both in my physical community and in the virtual community. For many of us, “protest” was not at the top of the list of things we looked forward to in our retirement, but here we are, and we’re not going anywhere. Oh, yes, we SHALL overcome! Thanks, Clare.